Wait, so there's only one song per side? Why? Wouldn't that get annoying, having to constantly go over and switch the records? anyone else getting a static-like noise in the right channel? it's in and out on all four sides for me. One of Bonobo's best albums by far. 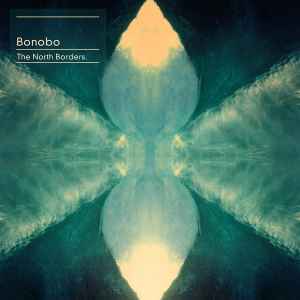 After BLACK SANDS, it'd be difficult for Bonobo to maintain his reputation, but THE NORTH BORDERS manages to do it. Sure, it's not as stunning as his previous album, but that's a pretty high bar. Instead, Bonobo branches out in other directions, like the mellow, folk-esque "First Fires" or the garage of "Emkay," or the more straight-up house of "Cirrus." His multi-instrumentation stays wholly intact, despite these new ventures, helping to fill out the sound, as with the plucked strings of "Saphhire" or the . He tries out a heavier bass with "Jets" or the typewriter rhythm on "Ten Tigers." Sure, a few of the tracks aren't as compelling-- "Know You," for instance sounds like a reprise of "Emkay" -- but it's still a pleasant listen, especially once the chopped-up chorus starts in. Even though Andreya Triana doesn't appear here, she's ably replaced by Erykah Badu, who makes "Heaven For The Sinner" appropriately angelic. Szjerdene, as well, adds some soul to "Towers," The darkly sad "Pieces" closes the album on a good note. For its faults, it holds up. After listening to Bonobo for quite some time, this release had to be a stunner to even compare to its predecessors. So when I first listened to 'The North Borders', I was disappointed. It lacked a coherency that his other albums, like Black Sands, had. However, this album requires multiple listens because a month went by and then this was on repeat for months. My personal standouts are First Fires, Jets, Know You, Ten Tigers, and Transits. It really grows. is this the RSD release? why the need to evolve when you're already doing great music (and original)???? bonobo, please reconsider! Anyone else notice the alternate track listing order for the box set versus the CD? I'm editing my review a year later because I just recently gained an appreciation for this album. I listened to the whole thing again (minus the first track which I still don't like) whilst driving down part of California Highway 1 along the Pacific. It made a great soundtrack for that experience and I really enjoyed it.